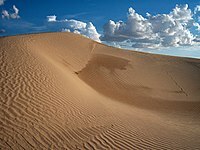 The Chihuahuan Desert varies slightly from cool in higher terrain to hot in low elevations. Antonio de Deza y Ulloa the founder of Chihuahua City in 1709. Creel at an elevation of 9,186 ft above sea level experiences a subtropical highland climate. Mennonite family in Cuauhtémoc, Chihuahua. Satellite image of the state of Chihuahua shows the varying terrain from the mountains in the west to the desert in the east. Agave lechuguilla indicator species for the Chihuahuan Desert. Cumbres de Majalca National Park is found in the transition zone from humid subtropical climate to semi-arid climate. 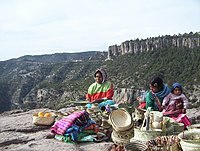 Tarahumara women near Lake Arareco.